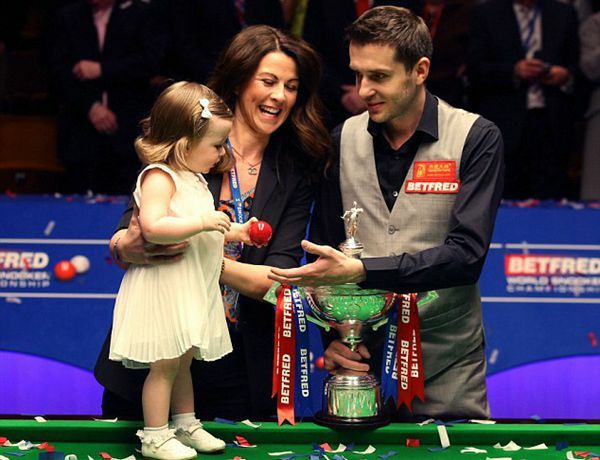 Selby celebrates with wife Vikki and daughter Sofia Maria after winning the Snooker World Championship final. Mark Selby became the sixth player to lift snooker's most famous trophy more than once at the Crucible by beating Ding Junhui 18-14 in the final of the Betfred World Championship. A thrilling final saw Ding, the first Asian player to contest the final, make a late surge from 16-11 down to 16-14, only for Leicester's Selby to win a tense 31st frame before sealing victory in the next. Selby, who first won the title in 2014 by beating Ronnie O'Sullivan by the same scoreline, joins Steve Davis, Stephen Hendry, Mark Williams, John Higgins and O'Sullivan as the only players to lift the trophy more than once at the Crucible. Overall he is the 13th multiple winner in the sport's history. It was a remarkable night for Selby's home city as Leicester secured football's Premier League title just minutes before the last balls went down in Sheffield. Collecting a record cheque for £330,000, 32-year-old Selby retains his world number spot and has now been top dog in the rankings at the end of the season for the past five consecutive years. This is his seventh ranking title and sixth success in a Triple Crown event having won three Masters crowns and one UK Championship. Selby produced fluent snooker only in brief spells throughout the Championship, making nine centuries. His impregnable safety game and matchplay toughness, allied with a cool temperament, made him as hard to beat as ever. He produced his best performance of the fortnight in the final, when the pressure was at its most intense. In withdrawing from the two ranking events before the Championship for personal reasons, Selby arrived in Sheffield without having played a competitive match for over a month. But any rustiness was was soon shaken off and perhaps his extra freshness helped him go all the way to the title in a tournament which demands endurance. Ding, by contrast, had to go through three qualifying matches just to make it to the Crucible having dropped out of the top 16. He played the best snooker of the tournament, making 15 centuries, just one short of Stephen Hendry's record for the most by one player. The 29-year-old lost the final in the early exchanges, going 6-0 down, and he could never get back on level terms. But having enjoyed his best run at the Crucible so far, the 11-time ranking event winner is bound to return next year feeling more confident of his chances, and less weighed down by the expectation of tens of millions of fans in his homeland. Ding's £137,500 runner-up prize sees him jump eight places to ninth in the rankings. Selby led 14-11 going into the final session and made a break of 57 in the opening frame before missing a red to a centre pocket. But he got another chance and added 46 to stretch his lead. In the crucial 27th frame, Ding made 60 before running out of position with two reds left, leading by 29 points. Selby played a clever cross double on the red to set up a 36 clearance which included an excellent thin cut on the final black with the long rest. Ding kept battling and took the next three frames without conceding a point, compiling runs of 73, 70 and 103 to close to 16-14. The third of those breaks was the 86th century of the tournament, equalling the record. Frame 31 lasted 51 minutes and was controlled by Selby, who built a 51-11 lead before potting the third-last red to go three up with four to play. And he needed just one chance in the next as a run of 74 secured the crown. "It's a great feeling," said Selby. "To win it once was a huge achievement, and something that I wanted to do, but I never dreamed of winning twice, I'm quite emotional. "The first time is always special, especially at the World Championship, the same when you win your first ranking tournament. And when you look at the people to have won it twice, to join that elite group is amazing. "I feel shattered. Last night I was so tired, to come out of that 10-7 up was huge because it was the first time I'd been ahead after the first day of the final. "Ding was under a lot of pressure, it was his first world final and there's massive expectation from China. I knew I had to capitalise early doors, every time I got a chance I punished him and scored. I missed a blue to go 7-0 up and if I had done that I might have won more easily. Ding showed class and came back to within a frame at times, but I managed to dig deep. "For a lot of this tournament my game has been average, whereas Ding has played great, the only bad session he had was in the first session in the final. I was second favourite, but here I am sitting here as world champion. I think it was just grit and determination, I never give in, no matter how badly I'm playing. Until that final ball is potted I still keep believing inside that I can win." Selby admitted that during the final session he tried to keep away from news of the football score in order to retain his focus. "Just before the last frame, someone I know in the crowd told me Spurs had drawn with Chelsea which meant Leicester were champions. That was the only time I knew, I tried to not to think about it, I didn't want to distract myself from what I had to do. "I don't know what is more of a shock, me winning the world title twice or Leicester becoming Premier League champions!" Ding said: "I played well in the last session. The start was very bad, I went 6-0 down and I was too far away from Mark. He played good safety and he knows how to win frames. The match got harder but I enjoyed it more towards the end. "Five years ago I got to the semi-finals and now this year I have gone one step further. Maybe next time I'm going to win this. It's good experience for my career, I'm enjoyed the final and not many players have got to the final here. "This season I have been working with Terry Griffiths for the first time and I think I have improved. If I keep playing like this I can win more tournaments."